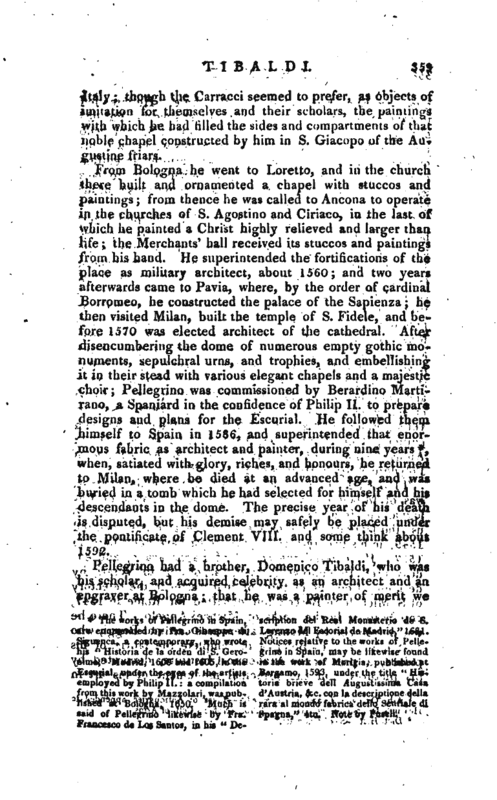 , otherwise Pellegrino, an eminent artist, was of Milanese extraction, but probably a native of Bo. logna, and from the date of his earliest picture known to us, the Nativity in the palace Borghese at Rome, painted 1549, in his twenty-second year, must have been born in 1527. He entered the school of Bagnacavallo, and endeavoured to improve himself, according to Vasari, by designing from the pictures of that master in the refectory of S. Michele in Bosco; but departed for Rome in 1547, chiefly to study the works of Michael Angelo. There he was patronized by Monsig. afterwards cardinal Poggi, who sent him back to Bologna to complete the fabric of his palace, at present the Academical Institute, decorated by his pictures, and the principal monument of his art in | Italy though the Carracci seemed to prefer, as objects of imitation for themselves and their scholars, the painting^ with which he had filled the sides and compartments of that noble chapel constructed by him in S. Giacopo of the Augustine friars. The works of Pellegrino in Spain, are enumerated by Fra. Giuseppe di Siguenca, a contemporary, who wrote his “Historia de la orden di S. Geronimo,” Madrid, 1600 and 1605, in the Escurial, under the eyes of the artists employed by Philip II. a compilation from this work by Mazzolari, was published at Bologna, 1650. Much is said of Pellegrino likewise by Fra. Francesco de Los Santos, in his “De scription del Real Monasterio de S. Lorenzo del Escorialde Madrid,” 1681. Notices relative to the works of Pellegrino in Spain, may be likewiie found in the work of Morigia, published at Bergamo, 1593, under the title “Mistoria brieve dell Augustissima Casa d‘Austria, &c. con la description* della rara al mondo fabrica dello Scuriale di Spagna,” 4to. Note by Fuseli. when, satiated with glory, riches, and honours, he returned to Milan, where he died at an advanced age, and was buried in a tomb which he had selected for himself and his descendants in the dome. The precise year of his death is disputed, but his demise may safely be placed under the pontificate of Clement VIII. and some think about 1592. 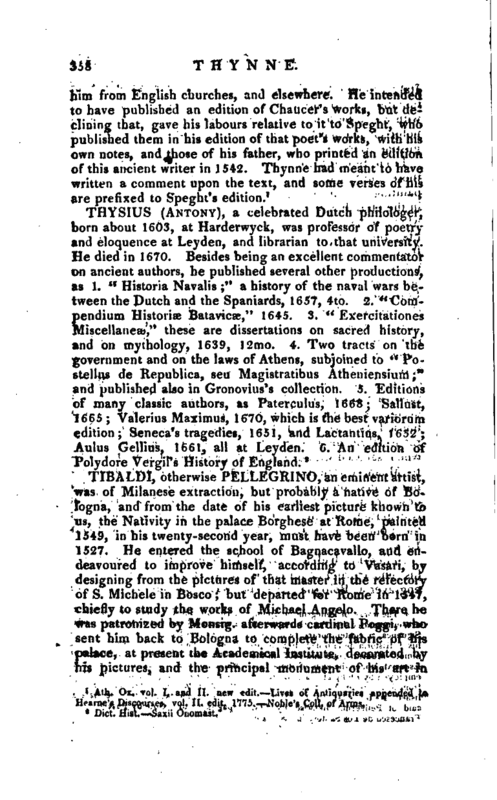 Pellegrino had a brother, Domenico Tibaldi, who was his scholar, and acquired celebrity as an architect and an engraver at Bologna that he was a painter of merit we | are told by his epitaph in the church dell’ Annunciata, but epitaphs are doubtful authorities, and of Domenico there is not even a portrait remaining. In engraving he was the master of Agostino Caracci. Pellegrino Tibaldi is considered, and with sufficient evidence from his works, as the greatest designer of the Bolognese and Lombard schools. 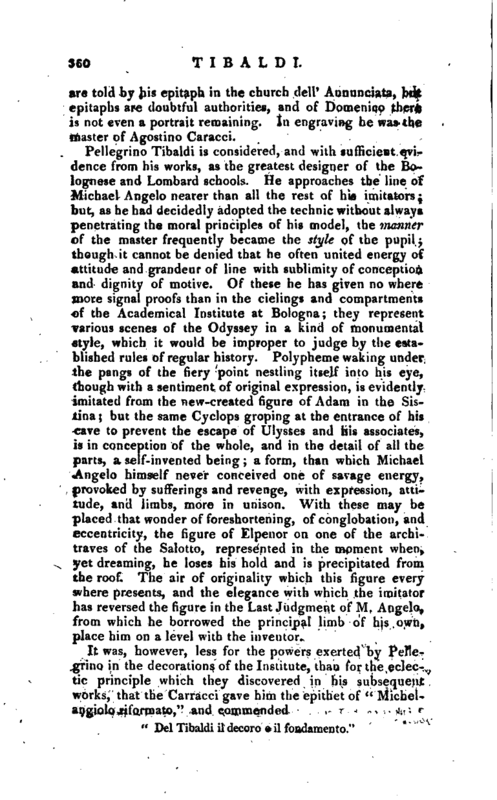 He approaches the line of Michael Angelo nearer than all the rest of his imitators; but, as he had decidedly adopted the technic without always penetrating the moral principle* of his model, the manner of the master frequently became the style of the pupil; though it cannot be denied that he often united energy of attitude and grandeur of line with sublimity of conception and dignity of motive. Of these he has given no where more signal proofs than in the cielings and compartments ef the Academical Institute at Bologna; they represent various scenes of the Odyssey in a kind of monumental style, which it would be improper to judge by the established rules of regular history. Polypheme waking under the pangs of the fiery point nestling itself into his eye, though with a sentiment of original expression, is evidently imitated from the new-created figure of Adam in the Sistina; but the same Cyclops groping at the entrance of his eave to prevent the escape of Ulysses and his associates, is in conception of the whole, and in the detail of all the parts, a self-invented being; a form, than which Michael Angelo himself never conceived one of savage energy, provoked by sufferings and revenge, with expression, atti-r tude, and limbs, more in unison. With these may be placed that wonder of foreshortening, of conglobation, and eccentricity, the figure of Elpenor on one of the archi-r traves of the Salotto, represented in the moment when, yet dreaming, he loses his hold and is precipitated from the roof. The air of originality which this figure every where presents, and the elegance with which the imitator has reversed the figure in the Last Judgment of M. Angelo, from which he borrowed the principal limb of his own, place him on a level with the inventor. | The compositions of the chapel Poggi in S. Giacomo, where the imitation of Michael Angelois blended with that of Raphael, Correggio, Daniel di Volterra, &c. contain the rudiments of their own system. 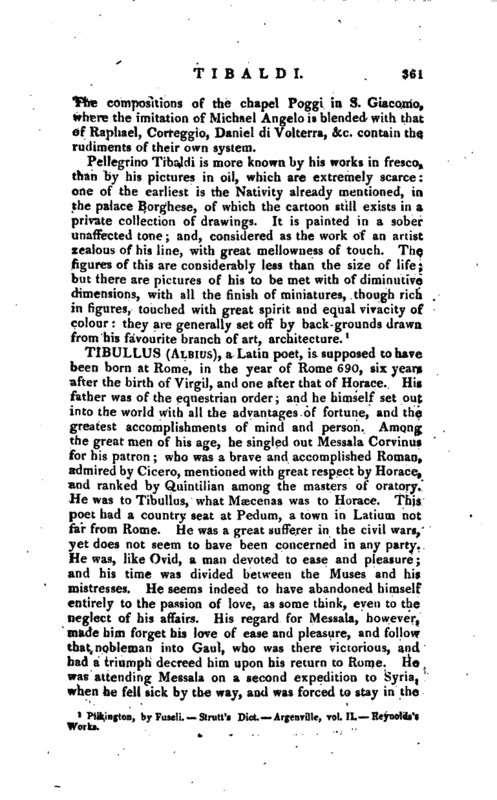 Pilkington, by Fuseli.—Strutt’s Dict.—Argenville, vol. II.—Reynolds’s Works.